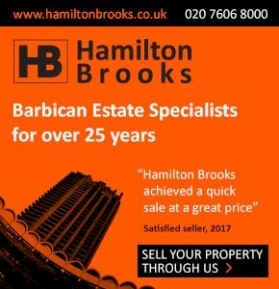 I once said one of the highlights of being chair of the Barbican Association was the opportunity to see unusual things. That was when I witnessed a Crossrail tunnel boring machine on its journey under the Barbican. My latest unusual thing was observing a training exercise by London Fire Brigade at Cromwell Tower. This had been planned since before the Grenfell Tower fire and was designed to give the firefighters experience of fighting a fire in a tall residential block. Obviously there wasn’t a fire – but there was lots of water. There were two big real fires in London that day – and Cromwell’s engines were slightly delayed because of them, arriving about 1.30 pm. They parked in Silk Street. There should have been a command unit, where we (John Tomlinson, chair of Cromwell House group and Common Councilman, an underwriter from the City’s insurers, various City officers, and me) would have observed the incident from, and also being able to listen to the messages relayed between the commander and his firefighters. But the command units were being used at the other fires or were on the other side of London, so the commander commanded by wandering around and we just watched from in and around Cromwell Tower, occasionally in among the hoses. We were briefed by Terence Short, the City’s fire safety advisor and a former firefighter himself. He told us that when a call comes into via 999 to the Fire Brigade’s centre in Merton and the details are taken, the computer determines which fire engines will be dispatched – usually one from the nearest station, with others following shortly after. The Fire Brigade would send six engines to a tower block fire. On the journey the crew are provided with information from the control centre – on the position of fire hydrants, maps and other information about the building, including risks such as asbestos or any vulnerable residents – and this is updated as information comes in from other calls. The information on the building and its residents comes from regular risk assessment visits undertsken by the Fire Brigade. The first firefighters to arrive assess the situation and establish a “bridgehead.” So we watched the firefighters from the first engine troop into Cromwell carrying lots of gear – hoses, breathing apparatus, equipment for forcing entry, first aid kits. This time they walked up the stairs but they can also take over a lift if one is available. All the time these early crews will be sending information back saying what resources they need – firefighters or equipment, so that other fire appliances may continue to arrive. Other firefighters will be gathering information on the spot, for example from a concierge, particularly about vulnerable residents. One of the first things they set up at the bridgehead was a whiteboard which kept track of firefighters who had breathing apparatus issued to them and how much air they had left. 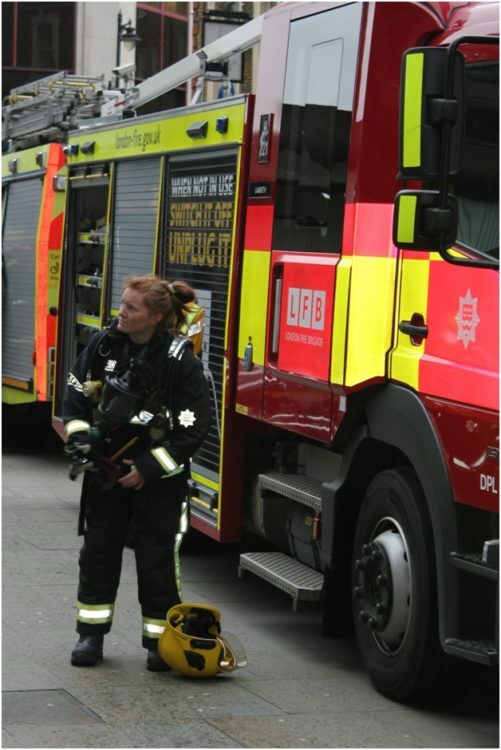 Fire Brigade is an equal opportunity employer! 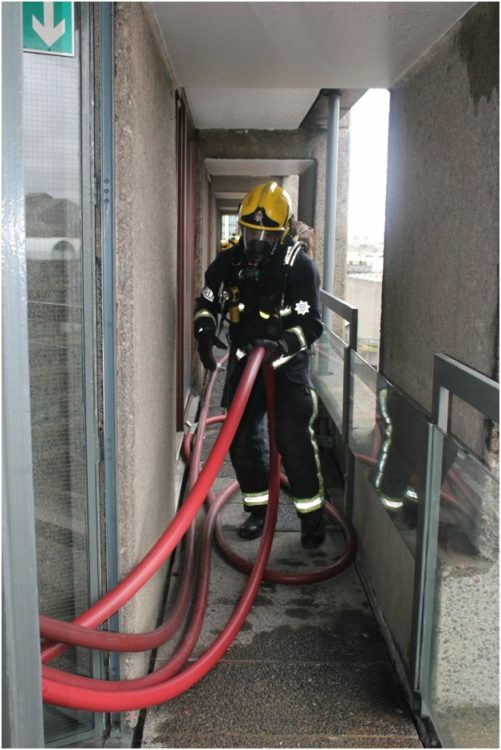 In this exercise the “fire” was on the 8th floor, and the firefighters set up their bridgehead on the sixth floor. Their commander explained that this was to ensure their own safety while they assess the fire and get issued with breathing apparatus and start to charge their hoses with water. The Barbican towers have “wet risers” which contain water. Dry risers are more common and simply provide a pipe to the water hydrant. But having a charged hose speeds things up. The firefighters then had to move up the staircase to the eighth floor hauling large heavy hoses full of water under high pressure. Most were wearing breathing apparatus, which consists of a facemask and a tank on their backs, which makes it hard to hear what people are saying – but they obviously get used to it. The apparatus holds enough oxygen for 40 minutes (of normal breathing; if the firefighter is working hard it gets used up more quickly). They are themselves responsible for monitoring how much air they have left and when they need to come back to replenish it. They have electronic monitors that bleep every so often to ensure they do check – and they have to acknowledge the bleep. If they don’t the bleep will turn into a continuous alarm. That signals that the firefighter has become immobile or unconscious and needs to be rescued. That system was introduced 60 years ago after a fire at Smithfield in which two firefighters wearing breathing apparatus died after becoming unconscious because no one knew where they were or that they were in danger. The firefighters didn’t actually enter the flat (this was an exercise). Instead they went onto the balcony and discharged their hoses over Cromwell Place, soaking a few passers by. There was a pretend casualty, and two firefighters in breathing apparatus went to rescue the casualty from the 8th floor and carefully escorted him down the stairs. At the end of the exercise there must have been about 25 firefighters all crammed into the lobby on the sixth floor before they packed away their gear and had a debriefing on the exercise. Terence explained that fire brigade policy was to tell people to stay in their flats if they are not directly affected by the fire, rather than evacuate the building. One reason became obvious as we watched: the firefighters take over the stairs. They move up the stairs towards the fire carrying heavy equipment and hauling heavy and hard to move hoses. Many of them are made extra bulky by their breathing apparatus. People coming down the stairs in an evacuation would simply get in the way of the firefighters – and would also be at risk from the hoses obstructing the stairs. The brigade’s advice to people above the fire who might see smoke rising is to ring 999 , tell the control centre where they are, and firefighters will be dispatched to secure them. While all this was going on Helen Davison, resident services manager at the BEO, and her team were outside Cromwell Tower in high visibility jackets ensuring that passers by were not alarmed. 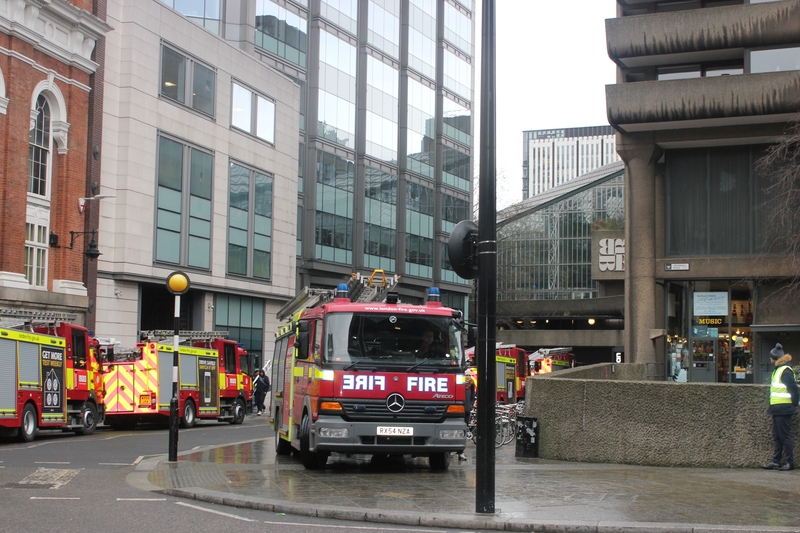 What struck her, however, was that most people walked by completely uninterested in the fact that there were six fire engines parked outside Cromwell Tower and many fire fighters moving about the building and the 8th floor balcony. The fire commander seemed pleased with the exercise; it gave the fire crews an opportunity to practice updated procedures and use new equipment post-Grenfell. These included new ways of approaching the floor of an incident and methods of marking their hoses and dividing the water in high rise building so they can isolate hoses from each other. He was particularly pleased that it gave his crews an opportunity to train with real water in their hoses. Being able to discharge water from a wet rising main is something the London Fire Brigade can usually only undertake at their national fire service college in Oxford – and Terence Short gave credit to the City staff who maintained the wet risers. The firefighters themselves looked pretty exhausted as they made their way down the stairs afterwards.